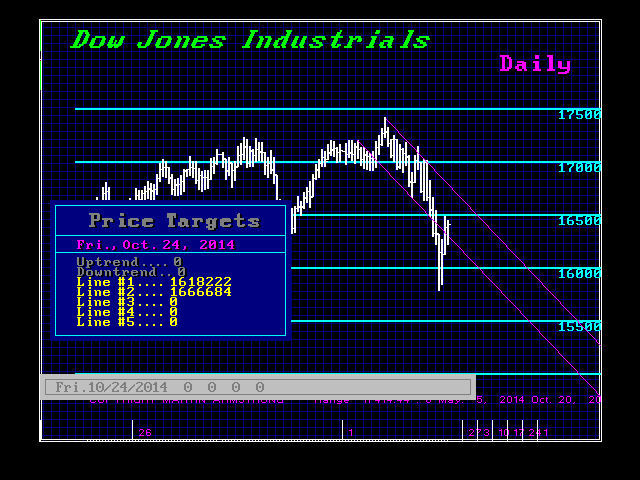 The Dow closed higher with an inside day. The turning points this week seem to be Wednesday (minor) and Friday (main). A reaction high this week still points to a lower low perhaps for the week of November 3rd. It appears that the Phase Transition in stocks will be postponed into the downside of the ECM. This is a reflection of the bubble that is unfolding in debt. This looks like the BIG BANG we targeted for 2016 is unfolding as we first scheduled back in 1985. This is the whole point of converting Socrates to run with access to the Web and to move the company public. This is not about “me” personally. This is about creating access to the knowledge of centuries. We all live and die and with death our knowledge evaporates into thin air. What if we can capture that knowledge and really pass it on to our children? This is my goal. We can live within the cycles instead of trying to pretend we can control the universe. We are human, subject to the battle with nature. We have been living a dream thinking government can do anything.